Although not as well known as German entry-level sport/luxury models like the BMW 3 Series, Audi A3, or Mercedes-Benz CLA-Class, the Acura ILX is actually well worth a look. It offers an impressive amount of value, which is not surprising seeing as it’s based on parent company Honda’s Civic. Introduced for the 2013 model year, the ILX received some important upgrades last year, gaining some much-needed engine power and keeping its design relevant. Though there are a few changes in line for the 2017 model, nothing too drastic is needed: Acura has molded the ILX into a solid contender in its segment, and the company likes to note the tremendous success the sports sedan has enjoyed in the under-35 segment since 2010. Acura’s trim lineups can look a little confusing at first, but the logic behind them isn’t complicated. The company basically counts major options packages as trims, meaning you start with any one model name and add certain packages in order to move up the range. The 2017 ILX will start at just under $28,000 for the base trim, which does not have any packages. In order of increasing value, you can then add the AcuraWatch Plus Package, the Premium Package, the Premium & A-SPEC Packages, the Tech Plus Package, and, finally, the Tech Plus and A-SPEC Packages, which top out at almost $35,000, still reasonable in a segment where prices can go well over $40k. What each of these “trims” contains will be explained below. One problem that has dogged the ILX during its early years is a weak powertrain. Acura has been fairly responsive to this shortcoming, however, and for 2016 it elevated the previously optional 2.4-liter inline 4-cylinder (I4) engine to the role of standard powerplant, giving the ILX 201 hp and 180 lb-ft of torque, managed by an 8-speed dual-clutch transmission with paddle shifters. To put this in perspective, the base BMW 3 Series 320i features a 2.0-liter I4 that puts out 180 hp and 200 lb-ft of torque—so the ILX is now managing just fine. The EPA has rated the 2017 model at a decent 25 mpg city/35 highway/29 combined, and only front-wheel drive (FWD) is available. Now for those packages. The base ILX is fairly well-equipped for its price, with features like a rear-view camera system and Bluetooth connectivity. The AcuraWatch Plus Package mostly adds a number of important safety technologies like adaptive cruise control, autonomous braking, lane-keeping assist, and pre-collision warning. The Premium Package updates the base radio with HD Radio, SiriusXM, and even a subwoofer, and throws in additional features like a universal garage door opener, driver’s seat memory, perforated leather-trimmed upholstery, blind-spot warnings, and cross-traffic alert. 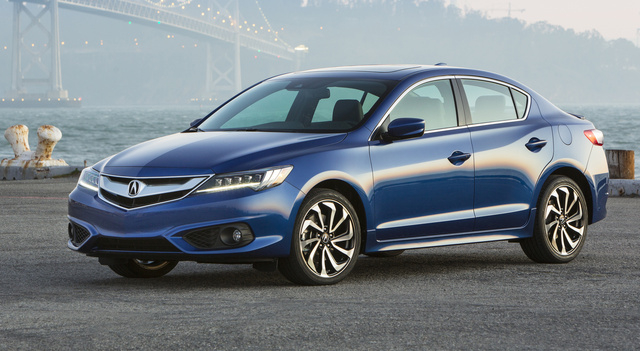 The A-SPEC package is what to add if you’re looking to emphasize the ILX’s sportiness. It includes unique exterior and interior appearance features, a trunk spoiler, front fog lights, and 18-inch machined alloy wheels. Choosing it alongside the Tech Plus Package—the top-tier “trim” option for the ILX—will get you everything the other “trims” offer and more: Surround Sound audio, the AcuraLink infotainment system with navigation, suede upholstery, custom door-sill trim, and aluminum foot pedals. Acura has also chosen to introduce three new color choices to the ILX lineup: Bellanova White Pearl, Crystal Black Pearl, and Catalina Blue Pearl. Every ILX comes with your run-of-the-mill safety features, like dual front airbags, front-side and front and rear side-curtain airbags, antilock brakes, hill-start assist, and an antitheft alarm. For more up-to-date safety tech, you’ll have to add those packages. Though the 2017 ILX has not yet been crash tested, the 2016 model did superbly, particularly with the Insurance Institute for Highway Safety (IIHS), which gave it a Top Safety Pick+ rating, the highest the IIHS offers. The National Highway Traffic Safety Administration gave the 2016 ILX 5 out of 5 stars for overall safety, with 4 out of 5 stars on frontal-crash and rollover tests. The 2017 Acura ILX is on sale as of April 13, 2016. Again, it may not bestow the kind of recognition or status you’d get out of a BMW or Mercedes. But it’ll likely save you a good deal of money, and you can expect it to deliver a reliable ride and hold its value exceptionally well. If you really do want a little more than a Civic (or a Nissan Sentra, or a Chevy Cruze, or whatever), the ILX is a great place to start. What's your take on the 2017 Acura ILX? TheHorror The death of the Verano would have helped sales, but Honda's own (new) Civic makes the ILX superfluous. Have you driven a 2017 Acura ILX?